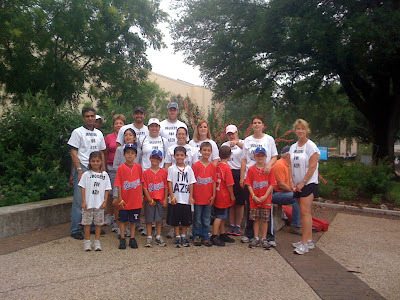 Cystic Fibrosis and Life: Great Strides 2011!! Wow! I'm not sure of the exact amount right now, but I believe we raised more than $2,000!! We actually had a team this year. It was such a great time spending time with people that care about Azer. They have been so supportive. I couldn't have asked for a better group of people. I just couldn't wrap my brain around the fact that these lovely people came out on a foggy, humid day to go walk 3 miles for Azer and for CF. Someone even came even though she couldn't actually walk with us due to a minor injury. Azer ran next to his teacher the whole way. I'm not sure of his time, but I couldn't even keep up with him. By the time I got over the finish line, he was already chilling with her. He ran the whole entire time. That kid just amazes me. He had fun with his team mates that came. Lol, he was so hyper before the walk. They all were, really. I'm so thankful for this day, and for all the support. It makes me feel like I'm not alone in this daily fight with Cystic Fibrosis. I pray there is a cure for CF soon.